NiCK'S SANCTUARY: SOPA on a Rope. In fact, Wikipedia were far from alone. Many major web players including Google, Twitter and Facebook have to a greater or lesser degree come out to voice opposition to the proposed SOPA (Stop Online Piracy Act) and PIPA (Protect Intellectual Property Act) bills being considered by the United States House of Representatives and Senate. Scenting blood after the bills received a political setback, the web companies have united and pressed forward with an unprecedented attack in the hope of killing the bills... to hang SOPA on a rope. On the surface, the basic intention of the bills is to curtail piracy of US media intellectual property on foreign websites and protect the interests of the media entertainment industry... but the problem is that the legislation is just far too clunky. While Wikipedia has gone dark for a single 24 hour period, there is a very real threat that free expression across the Internet could be at threat and the lights would go out everywhere. As far as I understand it, Web organisations would be responsible for policing their own users for infringements against the act... and preventing the use of offending material on their websites. Taken to extremes this could very well effect everyone. Do you ever link to a video on YouTube that has not been uploaded by an official source? Everyone does, I've seen my wall on Facebook alone get flooded with unofficially sourced clips from my friends. It doesn't matter if you are American or not, if you are using a US registered companies platform... SOPA covers you too... Could countless Facebook and YouTube users find their accounts suspended/restricted if SOPA or PIPA passed? And what of the blogosphere? I don't think I'd be safe... in no way do I encourage or endorse the acts of online piracy, but regular readers will know that I constantly use music or video clips to illustrate points that I make. Were SOPA or PIPA to become a reality, I have to consider that Blogger/Google might be forced to take steps to stop this kind of behaviour. I truly believe this would drastically choke free expression and freedom of speech on the Internet. In a speech to the Leveson Enquiry this week, Ian Hislop defended the freedom of press on the grounds that politicians and commentators should balance one another out... too much power in the hands of one is bad news for society as a whole. I'd like to add another party to that concept and make it a triumvirate - the public themselves... us. We are constantly receiving messages from the media and from our leaders but we are not mere receivers of what they have to say, we are in fact transceivers. We have the ability to form our own intellectual and emotional opinions based on our own interpretation of the facts. We ourselves have a voice... a voice that has as much right to be heard as any newspaper editor, film maker, pop star or politician. Twitter, Facebook, blogs - all of these comprise a major part of that voice... as we have seen only in the last year. When people decide to take hold of a message and spread it, nations can fall and rise again. 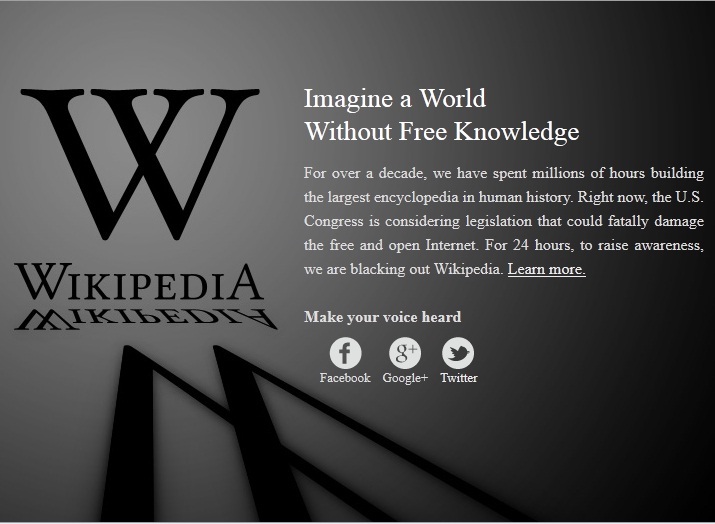 In fact it is happening now... many thousands of people are becoming mobilised in response to Wikipedia's stance. It has become a talking point and perhaps now the real fight has begun. Were the bills to pass... a lot of the content that has motivated people could be silenced. At best, SOPA and PIPA represent an ill thought out way of controlling a wild cyberbeast that has outgrown the entertainment industry's limited understanding and outdated business model. At worst, the bills are a cynical ploy by people behind the scenes who fear a Western version of the "Arab Spring", to put a mechanism in place that limits the online exposure of people with highly malcontent views. I'm not prepared to make a pronouncement that heavy but I do think it's worth keeping in mind. Obviously as a British citizen I cannot have a direct say in US Law, but as this is is something that affects my own rights and lifestyle, I do believe I have a right to request my own MP (via Email) and Government (via this petition) do all that they can to exert pressure and express my political dissatisfaction at this move. If you believe in a free Internet and enjoy and benefit from making use of its vast resources... I strongly urge you to consider doing something along the same lines. What do you make of SOPA and PIPA? Do you intend to make your opinions known to your own political representative? Do you think the bills will pass?